Magnum Opus, or Sir Grace as we know him, is a sweet, gentle young male who has the potential to be a nice junior herd sire. He has correct conformation and bite with superb bone density on a medium frame. 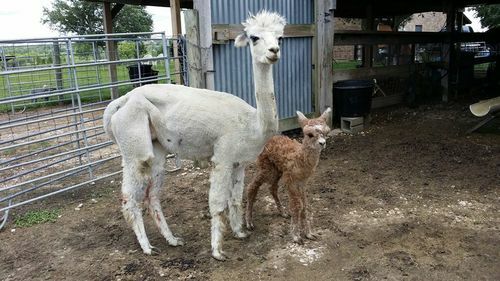 Hi first cria is a beautiful light silver gray female! We originally bought Kachemak from Alpacas de la Patagonia because she was a grey with a fine fleece. At 3 years of age, her fleece had a micron of 16.8. 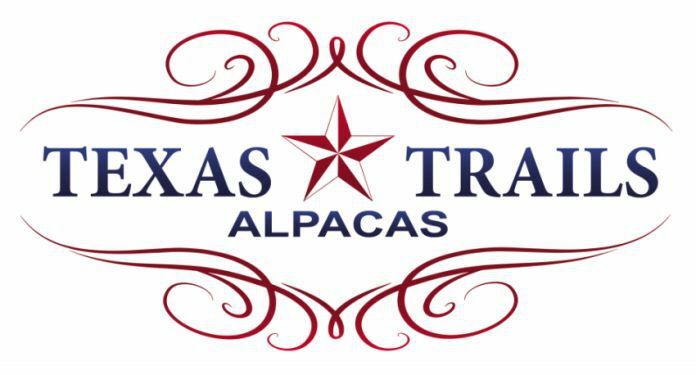 She has had several beautiful crias for us: grey, black, and roan. She is a wonderful mother and good milk producer. She currently has an adorable bay black male with a white blaze on his forehead and nose out of Bellagio of PVA. 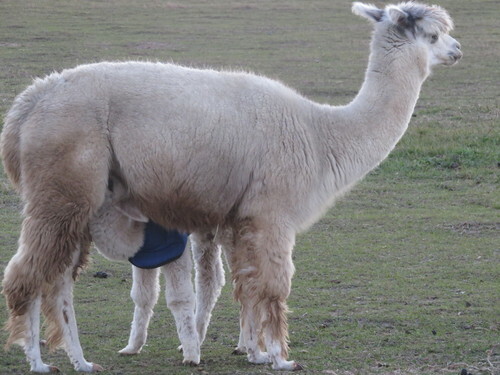 She sells with this cria at her side as a 3 in one package. Kumara's dam, Kachemak was a direct import from Chile. Kumara ("Sweet Potato" in Polynesian) is the Light Silver Grey color of her sire, Tierra's Magnum Opus. She is a big boned girl who delivered a beautiful Bay Black female out of Festivo in April 2013. Kumara has nice softness to her bright, fine fleece. And, her staple length is exceptional. We hope Kumara's fleece takes on Kachemak's best qualities. Kachemak's fleece had a micron of 16.8 at 3 years of age. On May 14th, 2014, after 371 days Kumara gave birth to a beautiful 20lb Medium Fawn boy. We are VERY excited about this little guy! 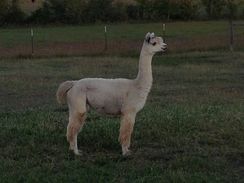 Kumara effortlessly gave birth to an incredible modern gray boy out of award-winning Tuscan Gold's Infinity. He is something special and was up and nursing in less than 15 minutes. 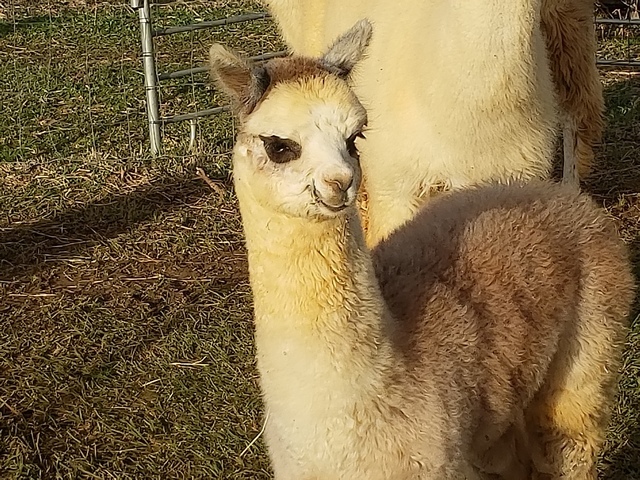 She is bred to Silveraldo's Peruvian Silver Fox for a spring 2017 cria. She is a great mom and delivers beautiful babies; we can't wait to see what 2017 holds. 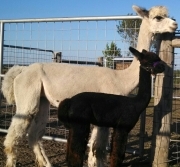 ** Updates: Kumara delivered a spectacular true black cria in February. He was up and nursing within 20 minutes. Beautiful boy! 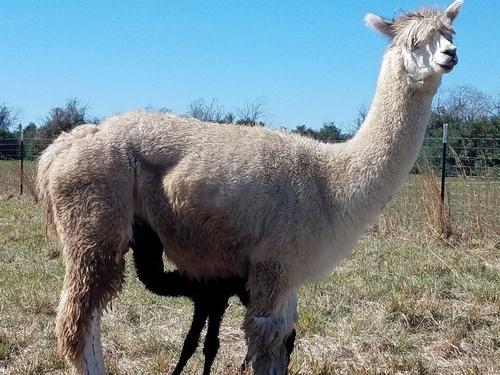 2018 cria update: This girl truly delivers. She had a magnificent silver gray boy 10/29/18. He is the spitting image of his mom. We can't wait to have him in the show ring in 2020.